Ever think of how safe your home is in terms of toxic chemicals? Safety is more than saving a life in an emergency situation or preventing an accident or injury; safety is also about creating safe spaces for you and your loved ones to live and thrive in. Unfortunately, the average household contains about 62 toxic chemicals! These are chemicals that we are breathing in and coming into skin contact with on a regular basis. And where are most of these toxic chemicals hidden? IN OUR CLEANING PRODUCTS! And they are wreaking havoc on our health. Think about the rise of autoimmune conditions, respiratory issues and cancers. Why are these occurring in abundance? In large part, it’s because of all the toxins we are exposing ourselves and our families to day in and day out. Our family has found an alternative called Norwex and we are in love with it! 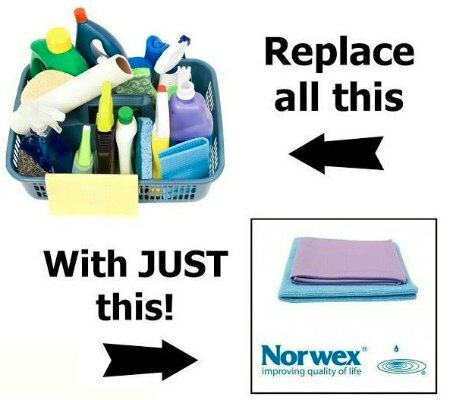 Norwex provides a way to clean faster, less expensively, easier, BETTER and SAFER. The hallmark of Norwex is superior microfiber cleaning cloths that are made of fibers that are 1/200th the size of human hair (that’s REALLY tiny so they pick up a lot!) and embedded with antibacterial microsilver. This ain’t no Walmart shelf microfiber! These cloths can remove up to 99% of bacteria from a surface with JUST WATER. No toxic chemical cleaners needed. Sounds too good to be true….but it is! We’ve been using Norwex for over a year now and cleaning has never been easier in our home….and this is with two very messy little ones and a dog! Check out this video for a visual science experiment of the Norwex EnviroCloth cleaning up raw chicken protein, and this one for an overview on how Norwex works. There are so many various YouTube videos about Norwex if you just do some searches. See for yourself! We sell it now because we love it so much and believe in helping people create safe havens in their homes. Contact us to go through a Norwex online presentation. Explore more or shop at our website here.